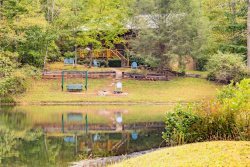 Established in 2004, Georgia Mountain Cabin Rentals has been a popular Blue Ridge property management company since its inception. Our experience is invaluable in the process of managing your investment cabin successfully. Working together with our FRIENDS, we develop a plan that will greatly exceed your expectations for the vacation rental lodging business and in turn make your Blue Ridge, Georgia experience a great one. There are many reasons people like to use their property as a rental/investment property. Maybe you have purchased a cabin to retire in but want to come and stay as often as you can prior to retirement, strictly investment, or a temporary vacation spot for several years. Sharing your special property with other people is a way to express the many things that you like about the North Georgia Mountains to others, and hey let's face it, they help you pay the bills as well, and in some cases cover all the expenses of a mountain home ownership, making your vacation stays in your cabin absolutely free!! Our customer service and reservation staff are friendly, professional and responsible. We have a full-time maintenance and inspection crew. Our maintenance crew participates in day-to-day customer service needs and deals with many different kinds of long-term maintenance issues. Since many of our property owners live a distance away, we look after our properties as if they were our own. Georgia Mountain Cabin Rentals is proud to be a one-stop shop when it comes to property management, real estate, and vacation rental services. Each arm of our business compliments the other and allows us to stay a step ahead of our competitors. With an extensive reach in the local market, you'll find there is no other choice but GMCR!